New Media has helped foster a healthy relationship between Nyla and I as I will always be sitting with her participating in the play because I personally feel that the greatest benefit occurs when children use computer with adults. This hence supports Vygotsky's theory (remember him, NIE mates?hehe!) of socially mediated learning where a child learns through scaffolding of a task by an experienced adult. So when I was invited to speak regarding the media activities I participate with Nyla, of course I was more than glad to do so. Ms Nura J-Esman, Mother of a 4-yr old, Educator and Former-Celebrity with Husband, Mr Esman Supa’at. A sought-after speaker at last year’s ‘Be A New Media Parent’ workshop, Nura is once again invited to share with us her precious moments in using the various new social media tools to educate and have a whale of a time with her daughter. This time round, Nura’s husband, Esman, will also shed light on how the new social media is significantly helping them to foster a closer bond within the family. I promise to share with you peeps the many new media activities I participate with Nyla. Mr E has also been roped in as well and he is absolutely thrilled to be sharing with the audience what are the fun stuff he always does with Nyla using new media. The other speakers in the workshop are Ms Claudia Lim, Founder of 24Seven Communications, a local social media agency and former school teacher, Mr Effendy Ibrahim, Consumer Business Lead, Symantec Asia South and Mr Bernard Leong, Entrepreneur and Investor with Thymos Capital LLP on online social networks (Eteract & iHipo) and web-mobile applications. 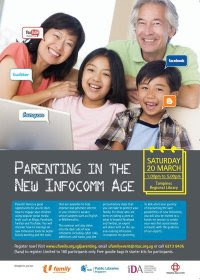 It is an event not to be missed, especially for parents who would like to know more about how new media can benefit your child socially and academically, if used appropriately. I'll see you there ya! Phew, thank God it's not past midnight! It's my father in law's birthday today. We already threw a birthday celebration at home for him and the other February babies at Sengkang last week. My dad in law with the songkok haji. Mwaccks. My bro in law to whom I'll sing The Climb by Miley Cirus to just spur him on. Jia You bro! We also dropped by Sengkang yesterday. I'm bad at giving him presents so I just gave him a peck on each of his cheek. Priceless tu...Hehehehe! Happy Birthday my very wonderful father in law. Semoga bapak always happy and healthy. Love you. Boy: Hello. Boleh saya cakap dengan Nurashikin? Paps: Why do you want to speak to her? Paps: Do you know who you are speaking to right now? Paps: I AM THE BIGGEST GANGSTER IN SINGAPORE! Well,I just wished the earth would swallow me, at that time. To say I was pissed at my dad then would be a major understatement. My Papa J was also a stalker. I used to frequent the then Ginza Plaza's Macdonald's and he would appear in front of my face all of a sudden. He was the one behind the decision of transferring me to Yusof Ishak Secondary School, his alma mater so that the teachers whom he knew would keep an eye (in this case, eyessss) on his only daughter. Obviously, back then, I was resentful of all these 'interferences' because it was downright embarassing for me. Now that I am a mother, I finally understood because Esman and I will do just the same thing to Nyla. *evil smile* nyeh nyeh nyeh! My dad choked up when he gave me away during the akad nikah as he shook Esman's hand 6 years ago. 'Lembik jugak si Jasni ni,' I overheard my aunty say. And I will never forget the day after I got engaged. My dad was cold towards me. Apparently, he bought me a tiny book about dads and daughters and was upset I didn't even say thanks. Oh papi, how to say thanks if you didn't hand that book personally to me. He put it on top of my book shelf. Konon, nak surprise la tu. My dad is also a very funny man. I honestly think Nyla, a natural comedian, inherited 'funny' genes from her Tok Daddy. I still remember clearly how he tricked my younger brother, Jam into trying wasabe. Jam took a spoonful and he let out such a loud shriek, we didn't know whether we should panic or laugh. Haha! We sure did roar at that Japanese restaurant! Till today, Jam is wasabephobic. Then during the New Year, my dad put on an 'arm tattoo sleeve' just to get a reaction from my forever serious elder brother, Bah. Yes, my dad can sometimes be lame but his granddaughter adorrreeeessssssss him. and her mommy adores him even more. Dad: How come you put your name as Nura J-Esman? Dad: How come it's not Nura Jasni-E? Me: Hahahahahahahah! Dad, that sounds so salah. Not glam leh. In case you never knew, you are my number one man in my life. With all the people I've encountered in my life and all that I've been exposed to, I wouldn't trade my paps, Mr Jasni, for a million bucks. Not for even a minute. My ol' man, Happy Birthday. Who is it? It's a Princess! Nyla has been 'into' this book by Helen Jackson for the longest time. If previously, she wanted me to keep reading this book to her every night, now, she reads to me. Well they say, children learn best through repetition so in this case, Nyla has sort of mastered this book and is now reading it independently thanks to the daily 'practice sessions'. Heee! What is so amazing about this book is that it is so ideal for Nyla who is a beginner reader as it has a strong visual appeal, which makes it very eye-catching and engaging indeed. It also has a clear structure, with an illustration on each page to reinforce the meaning of the text. We are all pretty much knackered so we have decided to just stay indoors today and tomorrow. And, we just realised that us, Starhub customers, have been rewarded with free viewing of any channel thanks to the long CNY break. That's it man. I foresee alot of fighting for the rest of today. Just a while ago, while I was frying pancakes, I heard so much bickering between the babe and her daddy. One wanted to watch Kung Fu Panda, the other, The Love Guru. Negotiating which channel to watch. Our little lady, being the drama mama that she is, panicked when she heard the National Emergency exercise siren. Anyway, whatever it is, the both of you better let mommy watch Rain Main later. Let me release my frustration here. Watched Rain Man, I did. I was aware that the privilege of watching Star Movies would end at 2359 which was about 40 minutes into the movie. I kept glancing at the clock, heart racing because I was expecting the movies fiesta to end at midnight. So when the clock showed 0015 and I was still watching my Tom Cruise on TV, I was really happy because I could watch the entire movie. Or so, I thought. The movie was scheduled to end at 0125hrs. At 0115, this appeared: To subscribe to this channel, please call 1633. I also froze when I saw the screen freeze! THANKS ah! Wahlao, really potong stim lor. At least let the movie finish la, Starhub. It was going to end in less than 10 minutes leh....Frust tonggeng man. There's a deep sense of spirituality and mysticism in this writer. Sometimes, I have to re- read every sentence so that I can get the real meanings, ideas and emotions that he is trying to portray. His books have definitely given me a lot of wisdom and positive insight into life. Mr Paulo Coelho, you have truly inspired me to be passionate in everything I wish to undertake. Anyway can you all smell the much awaited CNY break? Have fun with your loved ones my fellow readers. To my Chinese friends/readers, wishing all of you 'Gong Xi Fa Cai' and may the year of the Tiger bring you (and me!) wealth, health and happiness! Last Friday evening was our Ray's birthday celebration. I am not that a good of a planner but if it is for people who are dear to me, I 'll try and give my best-test shot. I chose Fiesta Brasilia (ya la, Im biased! Hee!) because of the beautiful setting and festive atmosphere. Many thanks to Deepa and the peeps of Fiesta Brasilia for the special arrangements and making our dining experience a memorable one. The passadors then swapped their skewers for some percussion instruments to sing our Birthday Babe a song. Nurul the Mak Yong ronggeng-ed while the rest samba-d.
Heee! Such a cute sight. 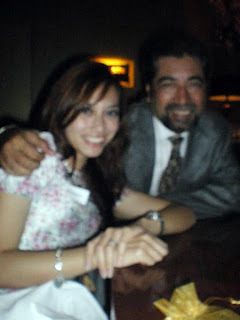 Still at the topic of friendship, earlier last week, I also caught up with another awesome buddy of mine, Hanin. 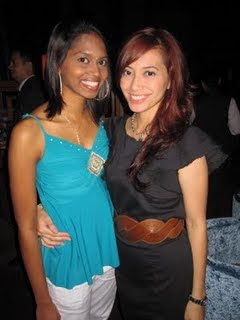 Our paths crossed back in 2002 when we were student teachers at Julia Gabriel Speech and Drama Centre. Hanin and I had hot fish soup at Bugis followed by apple strudel for dessert and just chatted the whole afternoon away. I had plenty of that the past week. I've read somewhere that the one common denominator of all successful people is a routine built on good habits. I also strongly believe that habits shape one's work ethics so I try to make Nyla's everyday as structured and routine as possible. the first thing Nyla does is to tend to her mini garden. Growing very well here. Well done, babe. Remember Jewellery the 2nd? Hehe! Yes, this fish is still alive and kickin' thanks to Nyla's care. Then Nyla and I will make the bed in the room and straighten the house. Back when I was young, whenever my mom was cooking, I'd also be in the kitchen 'cooking' and I used to enjoy it very much. So I also tried involving Nyla in the kitchen and I am happy to see that she too enjoys playing masak masak. So when I cook, I will pass her some of the ingredients for her to 'cook' her dishes. Usually I'll give to her the spinach batangs, some cut onions and garlic and whatever sauces she would want to add to her special dish of the day. For the dish in this particular picture, she chose Macdonald's curry sauce. This girl loves curry smell and yes, she loves to eat curry dishes. When she's sick and tired of being Rachael Ray, she will then proceed to become Handy Manny. Then, it's chillin' time with Daddy before he leaves for work. While waiting for her lunch to cool, Nyla and I would usually read a couple of books. She'd usually choose four books for me to read because that's her current age. After a full lunch, she'll change into her school uniform and then off she goes to school with Mummy. So yeah, that's more or less what Nyla does every morning. When I have the time to be her 'paparazzi' during the evening, I'll share with you peeps how her evening routine is like ok? I promise! 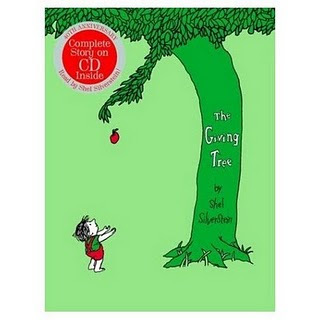 'The Giving Tree' by Shel Silverstein is one of my favourite books of all time. I came across this uplifting, yet deeply profound book written by Shel Silverstein while I was training to be a teacher at NIE. While the book is pretty simple, I personally feel that the message is universal and appeal to anyone, young and old alike. It is also a timeless kind of book. The past week, I read aloud 'The Giving Tree' to my tutees who are between the ages of 10-13 and they loved it very much. Of course, I had to tweak my post reading English Language activities catered to their abilities. The kids did a reflection and most of them feel that the morale of this touching story is self sacrifice. Whatever the boy wanted from the tree, he received. Most of my tutees also criticised the boy for only 'taking' because they argue that in life, one should give and take. I was very pleased to hear this because kids nowadays can be pretty selfish and for them to realise that 'give and take' is important, you kinda feel proud. They also mentioned how the tree is an epitome of a parent. Kids nowadays just do not understand how much their parents have sacrificed to provide for them and I sincerely hope that my tutees and even Nyla for that matter, will treasure their parents for all the sacrifices. if you haven't read this book, do borrow it. If you haven't watched this video, please do.